The state BJP on Thursday took out an ‘Asthi Kalash Yatra’ with the ashes of former prime minister Atal Bihari Vajpayee, which will be immersed in Parshuram Kund on Friday. State BJP president Tapir Gao and Dy Chief Minister Chowna Mein with the urn containing the ashes of the former prime minister, left for the holy pilgrimage Parshuram Kund where the ashes of former Prime Minister Atal Behari Vajpayee will be immersed today. Talking to Arunachal24 , Tapir gao said that, ” The final journey to Parshuram Kund for Asthi Visarjan of Bharat Ratna late Atal Behari Vajpayee ji , is a very emotional moment for me to accompany my idol in his last journey” . But before that Asthi being taken to Pasighat for people to pay their last respect, BJP sources said. The ashes of former prime minister Atal Behari Vajpayee was brought to Itanagar on Thursday and will be immersed in various rivers across the Arunachal Pradesh. 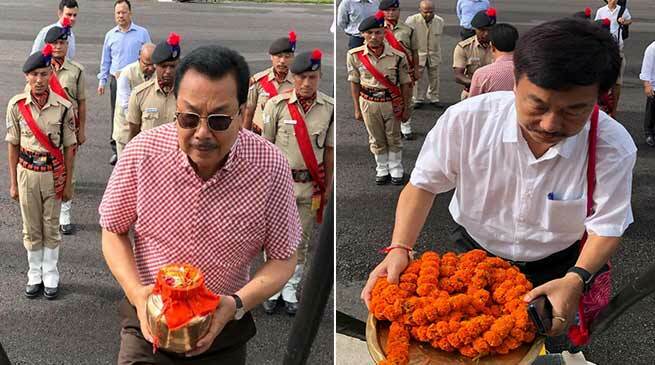 After state party president Tapir Gao brought from New Delhi on Thursday, the urn containing the ashes of the former prime minister, it was first taken to the BJP office in Itanagar for party workers to pay their last respect to the departed soul. Later it was taken to an auditorium where Governor Brig (Retd) Dr B D Mishra, Chief Minister Pema Khandu, his cabinet colleagues and other paid their respect. A condolence meeting was also organised on the occasion. The ashes is scheduled to be immersed at the holy Parshuram Kund today.